Nature’s Sunshine Golden Salve is a topical ointment containing extracts of comfrey leaf, golden seal root, yarrow flower, white oak bark, black walnut hulls, marshmallow root, lobelia herb, skullcap herb, myrrh gum, mullein herb, wheat germ and chickweed herb in a base of olive oil, beeswax, vitamin E and eucalyptus oil. 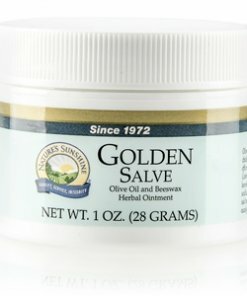 Golden Salve may be used to soothe and moisturize chapped lips. 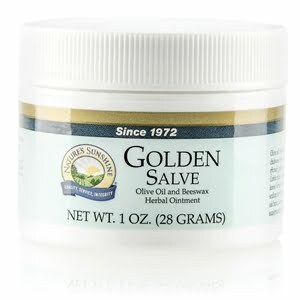 Golden Salve may also be used a soothing ointment to rough or chaffing skin. Nature’s Sunshine Golden Salve can be combined with Nature’s Sunshine Bone/Skin Poultice and may provide a greater relief to irritated skin. Instructions: Golden Salve is a blend of herbs, oils and beeswax that helps to soothe and moisturize rough, chafed, or chapped skin and lips. Apply liberally as often as needed. Olive oil, comfrey leaf, golden seal root, yarrow flower, white oak bark, black walnut hulls, marshmallow root, lobelia herb, scullcap herb, myrrh gum, mullein herb, wheat germ, chickweed herb, beeswax, eucalyptus oil, and vitamin E oil.